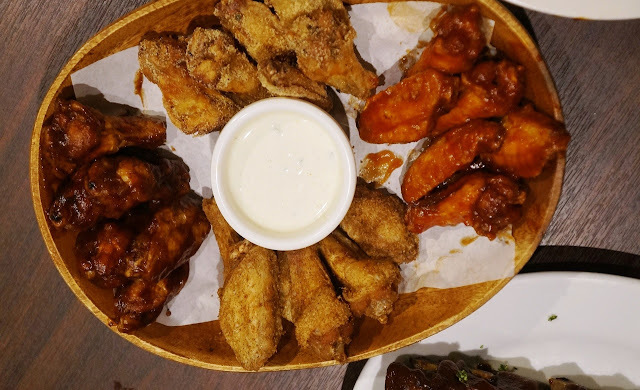 Be sure to check out Burgoo American Bar and Restaurant as they regularly come up with special meal combinations that allow you to save a lot. That's more value for your money when you partake of their special promo offers especially on special occasions like the recent Mother's Day where they had a special treat for moms celebrating the event with their families. We recently announced their combo meals that was only worth P1,999, a definite big savings compared to buying the dishes individually. I believe the offer was now even worth every peso. So would they be offering another special combo on Father's Day? Wishful thinking! My family and I have dine at Burgoo for a couple of times already and we find it really not just conducive to eating since they have plenty of tables and seats with enough space to feel more relaxed, but also because there's a lot of interesting stuff hanging on their walls showcasing american pop culture. Their dishes are also very affordable that you don't really need to wait for any promos. The spaghetti dish that came with the Mothers' Day Treat matched well everything else in the combo meal with rice, like the four-flavors of chicken, the fries, and of course the ribs! There's also two liters of iced tea so it was really is a great deal. 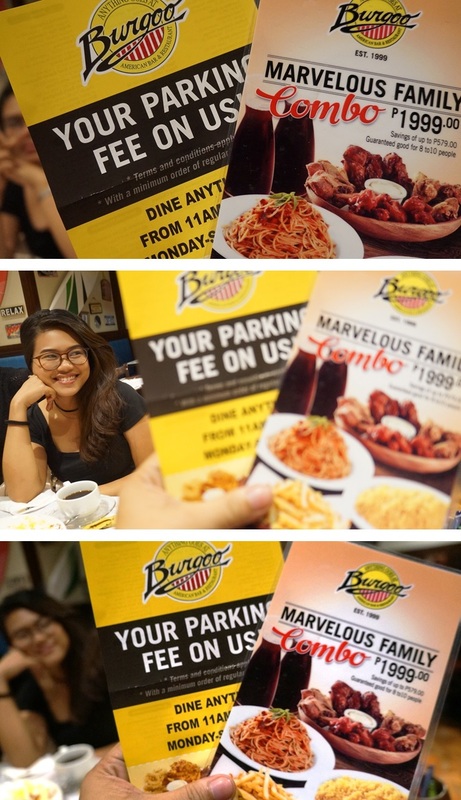 During a day when I had two events happening at the same time (but fortunately it was at the same venue), I got invited to join a gathering where the Marketing rep of the Burgoo American Bar and Restaurant brand wanted to present their Mother's Day special treat for Moms who would want to celebrate the event with their families. Burgoo should already remove the Bar from its name because their resto is a family-friendly restaurant that we often visit too for some weekends when we feel like eating American dishes. They have such a wide selection in their menu that you ae sure to find something that would interest you. The comfort food of pizza, pasta, burgers and a lot more are available here. Plus they serve fresh fruit smoothies unlike other restaurants that serves only iced tea and softdrink products. That American ambiance consist of surfboards, jerseys, posters, license plates, framed photos of celebrities, and a lot more eye-candies that could be never-ending conversational pieces for you and your friends or families. It's also great to have some photo ops with the decors as the background. Of course, they have that huge circular Burgoo signage. Though they should make a version that would also look good for selfies or groupfies. That lighted signage is not very flattering for photos. BTW, does Burgoo have a mascot? Maybe they should have one so the kids could have some form of character to associate with. Burgoo regularly has promos to put more value on your money. I still remember their vouchers that they give away so you can use them on your next visit. I think it was something free if you order a main entree on their menu. Sometimes they give a voucher the moment you enter the restaurant like a free complimentary dish of Nachos that's already big savings for you. From the flyers below, they offer free parking at their Rockwell Power Plant branch which is newly-renovated to look just like the other newer branches all over Metro Manila. My family and I frequent their Podium or Robinson's Galleria branches, but have also dined at their SM Mall of Asia branch during my youngest son's birthday where he got free scoops of ice cream. While waiting for your order, you and your kids can have fun scribbling on the paper mat that covers the entire table. At every table, they provide crayons which is used by your server to write his or her name. Since my daughter, Hannah Krystelle, and I love to draw, we would be the first ones to sketch something. We will be followed by Hezron Kyle who has already began to appreciate the arts, and then by Hansel Kyro who would also try to make fun of our drawings. My wife would just smile at us while we work on our creations. This is a bright idea that I only find here at Burgoo. Maybe they could offer more crayon colors, and find a way that we could bring home our art when we're done. I ordered the Kiwi Smoothie or Shake since I prefer the healthier drinks rather than the junk colas or sugary-sweetened iced teas. There's nothing better than to refresh yourself with something you know is good for your health. And if you're looking for a huge serving of rich and creamy Cheesecakes, then look no further. Burgoo should be applauded for having one of the best cheesecakes around. They are not stingy with the quality and size of the serving, and these sweet treats are available in many varieties. It is best for sharing too since eating one of these all by yourself may be too much. Meet the gang who devoured the dishes served by Burgoo. 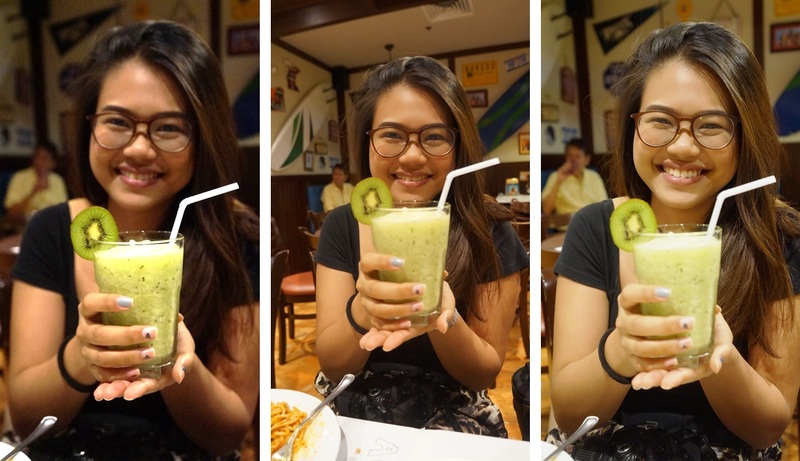 From the photos, it is not doubtful that I've gained a lot of weight for being a food blogger. It is just so heavenly to eat many sumptuous dishes from the many outstanding restaurants that I visit, and that includes Burgoo. Thank you very much Burgoo!!! We could probably eat up an entire combo meal meant for 8 to 10 persons if they are eaten together with your friends or loved ones. You'll not notice the time pass by while you chat with colleagues or the barkada, and Burgoo offers a place that is so cozy for dining at any time of the day. So come celebrate all your special occasions here at Burgoo!! !